Join us on a tour, and see for yourself whether this rugged escape can – as some imagine – become a lucrative tourist destination. TOWNSHIP 3, RANGE 7 – Few hikers cross the summit of 1,964-foot Deasey Mountain, a remote peak east of Baxter State Park that’s topped with a fire lookout. Getting here requires a trek of at least 5 miles on the International Appalachian Trail or navigating miles of overgrown paths and logging roads along the East Branch of the Penobscot River. Those who make the journey are rewarded with vistas of mile-high Mount Katahdin, and an overview of 100,000 acres of dense forests and river valleys that are becoming Maine’s newest, and perhaps least-known, North Woods destination. The National Park Service administers the National Park System. • HOW PARKS ARE CREATED: It takes an act of Congress to add a unit to the system. Congress typically calls first for a study of the area to determine its significance and suitability. NATIONAL PARK: A large area with various natural and historic assets. Hunting, trapping, mining and related activities aren’t allowed. NATIONAL PRESERVE: Similar to a National Park, but hunting, trapping and oil and gas drilling are permitted. NATIONAL MONUMENT: The president may designate landmarks, structures or other objects of historic or scientific interest. National Recreation Area: Centered on large water bodies or near urban areas, these sites are meant for large numbers of visitors. SAINT CROIX ISLAND in Calais, which is an International Historic Site shared with Canada. • NATIONAL FOREST: Maine also has 42,000 acres of National Forest. The 750,000-acre White Mountain National Forest in New Hampshire straddles the Maine border. National Forests are open to commercial logging and livestock grazing, as well as camping, hunting and fishing. They are administered by the Department of Agriculture. • WATER BODIES: Maine also has a water body in the National Wild and Scenic Rivers System. The Allagash Wilderness Waterway was the first state-administered area to be included in the program, in 1970. Today, the York River is being considered by Congress for designation. This is the Katahdin Woods & Waters Recreation Area. It has been assembled by Roxanne Quimby, one of Maine’s most ardent conservationists, and her Eliotsville Plantation Inc., a private, Maine-based foundation. Day-to-day work now is being handled by her son, Lucas St. Clair. The Quimby family wants the area to become a 150,000-acre destination, split equally between a new national park and a national recreation area, embedded in the largest forested area remaining this side of the Mississippi. The family’s bold vision has been met with both praise and scorn. Critics question whether recreation will produce significant economic benefits for the area, especially good-paying jobs, and the prospect of a federally owned park raises fears about restrictions on snowmobiling, hunting and other traditional outdoor activities. Nowhere is the discourse more intense than in nearby Millinocket, where the collapse of a century-old paper-making economy has forced residents to confront an uncertain future and consider a greater role for recreation and tourism. Debate over the pros and cons of a national park is likely to continue for years. But all around Deasey Mountain, it’s clear that Quimby’s dream already is taking shape. To the north on an old logging road, a brown-painted sign with white lettering – a replica of those used in national parks – reads: “Welcome to Katahdin Woods & Waters Recreation Area.” It marks a key access point to the 70,000-acre “park unit” and features icons for hiking, biking, horseback riding and camping. Workers nearby are preparing two riverside cabins for cross-country skiers and other backcountry travelers. Details are pending, but a local campground at the north end of the 10-mile river corridor may operate the cabins, while a sporting camp on the south end offers vehicle shuttles. To the southwest, a day-use-only “loop road” with scenic overlooks and points of interest has been created, drawing a comparison to Acadia National Park’s famous loop road. On the east side of the river, four “recreation units,” so far totaling 30,000 acres, are set aside for hunting, trapping and snowmobiles, as well as sustainable forestry. One abuts Lunksoos Camps, a 133-year-old hunting lodge in an area visited by Henry David Thoreau and Maine Gov. Percival Baxter on their journeys to the Katahdin region. It has become a de facto park headquarters and information center. At the Lunksoos boat ramp, a kiosk holds glossy maps of the recreation area. The maps and more information are available on the Internet at katahdinwoods.org. Whatever the outcome of the national park effort, Katahdin Woods & Waters now is open to the public, free of charge. Work is underway every day this summer to make it more welcoming and accessible. To get a sense of what this new recreation area has to offer, a reporter and photographer from the Portland Press Herald/Maine Sunday Telegram traveled the land for five days. We trudged 11 miles to and from the Deasey summit and bushwhacked up a planned trail on nearby Barnard Mountain. We canoed through Class III whitewater and portaged around raging rapids on the upper East Branch, one of Maine’s most spectacular and least-paddled rivers. We rode mountain bikes on routes meant to tempt riders and draw cross-country skiers this winter. And we sought out camp owners and local merchants who call this region home, but worry about where tomorrow’s jobs will come from. 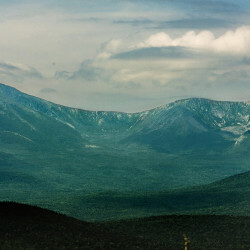 • Can the Katahdin Woods & Waters Recreation Area draw more people and more money to this special, underappreciated corner of Maine? • Would that effort be enhanced by creating a national park? Dawn was illuminating a high point of land on Route 11, south of Patten. Green hills pierced the ground fog, like islands in the ocean. A woodpecker drummed in the distance, its staccato lost as a logging truck strained up the grade. In the west, last night’s moon faded beyond Mount Katahdin. At Lunksoos Camps, Susan Adams was preparing to hike Deasey Mountain, the highest point on the Katahdin Woods & Waters land. Adams and her husband, Mark, are the area’s recreation managers. They’ve been searching for the best route up Deasey from the river, but keep hitting cedar swamps. On this morning, Susan was taking us to see the work in progress. We’re joined by Ian Grady, a Portland communications consultant for Eliotsville Plantation. The mid-July morning was hot and calm as we motored upstream to Big Seboeis campsite, where the Seboeis River joins the East Branch. We skirted a rock embedded with a large, iron ring, a legacy of when lumbermen floated thousands of logs downriver each spring. As Deasey Mountain came into view around a bend, an eagle launched from a tree. A moose exited the water and trotted away as we approached the campsite. Eliotsville Plantation has closed old logging roads to vehicles along the east side of the river, and nature is taking over again. We picked our way through saplings that have grown up on the road. We convinced ourselves that Susan Adams’ new, natural insect repellent was lessening our torment from the mosquitoes and black flies. In time we reached a washed-out jeep trail that leads to an abandoned fire warden’s cabin. Trail crews have used blue and orange flagging tape to mark a new route over higher ground. It follows an unnamed brook that tumbles down the mountain through rocky forest. Maine Conservation Corps crews were set to cut the trail this summer. After a while the route reached the cabin, the summer home to the fire warden and his wife in the late 1940s. The roof is caved in. It’s a safety hazard, so Adams plans to burn it and haul out the debris this winter. Now the trail climbed steeply to the craggy summit and the fire lookout, which was restored by the Maine Chapter of the International Appalachian Trail. An unusual “cab-style” with no tower, it’s listed on the National Historic Lookout Register. Clouds that would bring rain later in the day were forming on the horizon, but Katahdin and its adjacent peaks were visible. To the northwest, the Traveler mountains. To the northeast, Sugarloaf (the Penobscot County version) and Mount Chase. Looking west, the Wassataquoik Stream valley and Barnard Mountain, where crews recently blazed a trail that offers close-up views of Mount Katahdin and Katahdin Lake. Gazing across the landscape inspires contemplation: What is the prime attraction here? What’s the “wow” factor? What makes this area park-worthy? At Baxter State Park, the “wow” factor is Mount Katahdin. Deasey is no Katahdin. It’s a minor peak, most prominent now as an anchor for the International Appalachian Trail, which starts in Baxter and snakes 138 miles through Maine before crossing into New Brunswick. But Katahdin Woods & Waters needs more than a handful of hardy hikers who sleep in trailside shelters and carry their own food. The 16-mile loop road is one answer. We drove along it in June. We saw where visitors can pull over for scenic views of Katahdin. We saw opportunities to walk or bike along adjacent trails, and stroll out to Orin Falls on Wassataquoik Stream. Casual day hikers can jump on the IAT to access the new path up 1,621-foot Barnard Mountain. For little effort, they’ll view Mount Katahdin from a rocky ledge. Still, the loop road here isn’t in the same league as Acadia National Park’s 27-mile circuit, with its bold-coast ocean views and points of interest, such as Thunder Hole and Sand Beach. To appreciate this region, visitors will need to embrace the North Maine Woods experience, the solitude, the vastness, the history. One way to become immersed in the experience is to stay along the East Branch, at primitive campsites or in cabins and campgrounds. We chose Bowlin Camps, eight miles off the paved road to Matagamon. Thoreau stopped here on his 1857 expedition. We slept in a log cabin where the famous naturalist and writer reportedly stayed. Bowlin Camps caters to traditional sportsmen. Bear hunters pay $2,395 a week in September for a cabin, meals and a guide. Hundreds of snowmobiles arrive in winter on a major sled trail through the property. The 7-mile snowmobile route over the river to a ridge called The Lookout will be closed to motorized vehicles next winter. As new land-use practices in Katahdin Woods & Waters take hold, Bowlin Camps is thinking about how to appeal to bikers, hikers and sightseers, too. The new Bowlin Camps website includes day trips for family vacations. It suggests taking a mountain bike ride to The Lookout and hikes to two impressive rapids on the river. Also on the list are the Patten Lumbermen’s Museum and stores run by the area’s small Amish community. Bowlin’s new offerings reflect a wider recognition in Maine’s North Woods that attracting visitors today means straddling the 19th and 21st centuries. In our cabin, gas lights cast a yellow glow, until the electric generator was cranked up for three hours in the evening. There’s no refrigerator, but a kitchen and an indoor bathroom smooth the rustic edges. Cellphones don’t work here, but the camp now has wi-fi capability. The connection’s spotty inside the cabin, but better at the lodge. The clouds gathering in the west over Millinocket Lake were pushing toward Katahdin. In 30 minutes, they had obscured Baxter Peak. But the lowland view from the Deasey summit across the East Branch called to mind another example of the interplay between traditional solitude and modern connectivity. How it plays out could affect the future of Katahdin Woods & Waters. During our visit, we wanted to drive a passenger car from Bowlin Camps to Lunksoos Camps. Can’t do it. They’re 13 miles apart on the river, but unimproved roads mean taking an almost two-hour drive around Patten and Shin Pond. Connectivity is important for weekend explorers who aren’t on Thoreau’s 19th-century schedule. They could benefit from tentative plans for Matagamon Wilderness Camps, at the northern end of the river, to work with Bowlin Camps on Adams’ effort to provide two riverside cabins for cross-country skiers. That would allow visitors to have a hut-to-hut experience or stay at either end. Maine Huts & Trails is expanding this approach in western Maine, blending backcountry day trips with a string of lodges that offer comfortable beds and hearty meals. East of Moosehead Lake, the Appalachian Mountain Club has a similar model at its Maine Wilderness Lodges. The AMC experience, quantified in a survey last year, is instructive. The lodges hosted 4,700 overnight guests in 2007. The total grew to 6,200 in 2013, and will increase again this year, despite one of the three lodges being closed for repairs. More revealing: Seventy percent of visitors came from out of state. One in five stayed at other properties during their trip. One-quarter visited a historic or cultural site, 67 percent ate at a local restaurant and 77 percent shopped at a local store. This potential is understood by Adams, who serves on a steering committee made up of business and other interests in the Katahdin region. They’re working on a scenic byway project that uses federal money and state administration to create “gateway” information facilities at Sherman, Patten, Matagamon and a location west of Millinocket. Roadside signs for the “Katahdin Woods & Waters Scenic Byway” are up. Work on information kiosks is expected to begin next year, according to Fred Michaud, a planner at the Maine Department of Transportation who grew up in East Millinocket. Maybe that’s the way to view this evolving landscape from the Deasey summit – a region that can be branded to attract visitors for a range of activities in various locations. Many visitors now drive up Interstate 95, roam around Baxter State Park for a couple of days, then head back south. 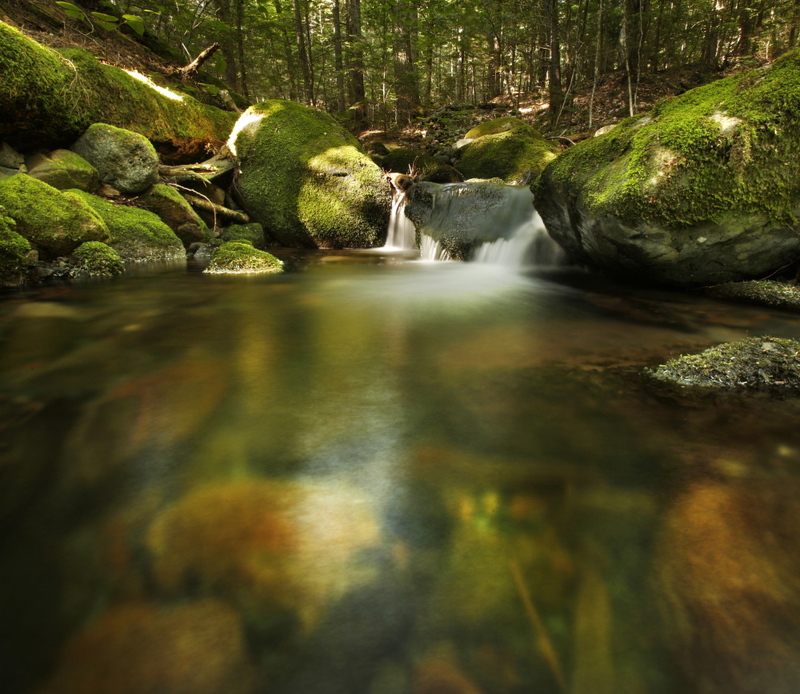 Can marketing “Katahdin Woods & Waters” entice them to extend their stay and venture east? Would “Katahdin Woods & Waters National Park” add to the appeal? Those questions lingered as our group descended Deasey Mountain. At an old tote road, Adams said she wanted to try to find a new, shorter route to the river. Past attempts had landed her in a “Bermuda Triangle” of cedar swamps that were unsuitable for a new trail. Using a handheld GPS and a compass, we took bearings and headed east through the tangled, buggy woods, skirting wetlands. Adams hung flagging tape as we made progress. Slowly, we discovered higher ground and emerged on old logging roads that led back to the Big Seboeis campsite. A new trail had been blazed, a new connection to the future of this grand place.